Sky Tram Costa Rica - Admire Costa Rica canopy from the sky! Glide through the Treetops and Explore the Canopy! An Adventure for All Ages! A Costa Rica Sky Tram Adventure is the perfect adventure for your entire family! Your relaxed canopy tour on a Costa Rica aerial tram will allow you to explore beautiful flora and fauna with a bird’s eye view. 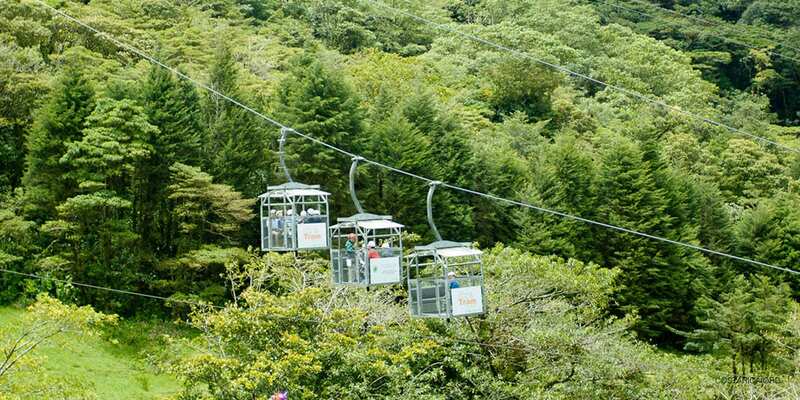 Adventure and nature lovers alike will love the open-air gondola that floats through both tropical rainforests of Arenal Volcano National Park and cloud forests of Monteverde on a series of double-cabled lines across the top and along the floor of the forest. The gondolas usually seat approximately 6-8 passengers and have a roof to protect you from any occasional rainfall. As they quietly glide through the forest, your guide will point out tropical wildlife including birds, howler monkeys, sloths and iguanas while you enjoy breathtaking views of the canopy. Sky Tram tours usually stop at an observation deck where you’ll see even more spectacular views of the surrounding rainforests and mountains. Sky Tram tours are great for all ages. They offer the same stunning views that you get on hanging bridges or a zip line tour. You’ll float along at the same height of the trees, allowing you to enjoy Costa Rica’s natural beauty from a unique perspective. Costa Rica Tram’s are located in many different areas all over Costa Rica. Sky Trek tours at Arenal are very popular. The gondola takes you up 4000 feet to the highest mountain near the majestic Arenal Volcano, giving you incredible views of the Arenal Volcano and Lake Arenal. Lake Arenal is not only man-made, but it’s the largest lake in Costa Rica. You can easily access the tour through the popular town of La Fortuna. You’ll stop at an observation platform so don’t forget your camera to capture all the breathtaking views! Monteverde is another popular destination for an aerial tram tour. The gorgeous cloud forest is over 5000 feet about sea level. In addition to all the beautiful tropical birds flying around your tram, you will also get a chance to marvel at the cloud forest canopy and the Continental Divide! You can also combine your tram tour with a zip line tour, cloud forest walk and a visit to the herpetarium. Another one of the most popular Aerial Trams in Costa Rica is the Atlantic Tram. This borders the Braulio Carrillo National Park. It is easily accessed from both San Jose and the Caribbean coast cruise ship ports. After admiring nature from above, make sure to visit the nearby snake exhibit, frog and butterfly gardens. You can easily combine your sky tram ride with several other nearby adventure tours. You can trek through the rainforest on an ATV tour, hike along floating bridges on a guided tour or zip line. Close to Arenal and Monteverde you can also experience a kayaking rafting adventure. Most Aerial Tram operations also offer a buffet lunch, allowing you to make your sky trek trip a day-long experience.